Welcome to the Villa Ritz kindergarten. We are a bilingual kindergarten offering an all-day approach to childcare. 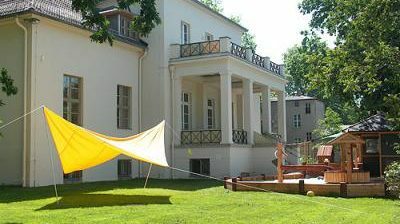 Since opening in 2007, the Villa Ritz in Potsdam has provided loving and flexible childcare for children from nine weeks to schooling age. Alongside comprehensive all-day childcare with long opening hours, we also offer modern families activities and services tailor-made to their needs. Ensuring the well-being of children and their families is at the centre of everything we do.